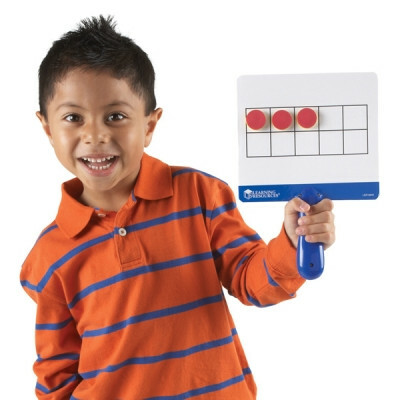 Teach the foundational concept of 10 with ten frames! Set of 4 magnetic, write and wipe handled answer boards with 100 double-sided foam magnetic counters in 2 colours (red on one side, yellow on reverse). Students can work directly on the answer boards with magnetic counters, or use write and wipe markers (not included). Works on ten-frame concept that visually allows students to ‘see’ how to make 10. Comes packaged in a box with teachers guide.